Have you ever wondered when we will be able to travel to distant stars as easily as in science fiction stories? NASA Glenn's Marc Millis (pictured above), who has taken a break from Project Management for NASA's Breakthrough Propulsion Physics (BPP) Project to return to conducting research, offers this assessment of the prospects for achieving the propulsion breakthroughs that would enable such far-future visions of interstellar travel. This web site focuses on the propulsion related issues, explaining the challenges of interstellar travel, existing propulsion ideas, and the possibilities emerging from scientific literature that may one day provide the desired breakthroughs. To simplify the presentation for the general public, analogies to familiar science fiction are used. This report is intended for public audiences, whereas researchers might want to check out the Breakthrough Propulsion Physics Project web site. The ideal interstellar propulsion system would be one that could get you to other stars as quickly and comfortably as envisioned in science fiction. Before this can become a reality, three scientific breakthroughs are needed: discovery of a means to exceed light speed, discovery of a means to propel a vehicle without propellant, and discovery of a means to power such devices. Why? - Because space is big, really, really, really big. Space takes up a lot of space! 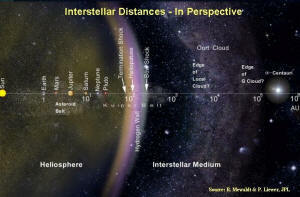 Interstellar distances are so astronomical (pun intended) that it is difficult to convey this expanse. Consider the following analogy: If the sun were the size of a typical, 1/2 inch diameter marble, the distance from the sun to the Earth, called an "Astronomical Unit (AU)" would be about 4 feet, the Earth would be barely thicker than a sheet of paper, and the orbit of the Moon would be about a 1/4 inch in diameter. 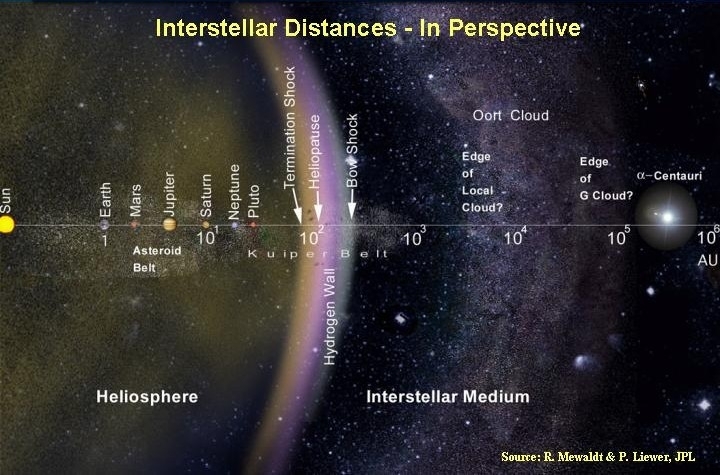 On this scale, the closest neighboring star is about 210 miles away. That’s about the distance from Cleveland to Cincinnati. To help put this in perspective, consider that it takes light over 8 minutes to cover that 4 ft "Astronomical Unit" mentioned before. Light is the fastest thing that we know to exist! Just imagine...How long will take you to travel 210 miles if it takes you over 8 minutes to travel just 4 feet? Actually, the answer is 4.2 years. Our nearest neighboring star, Proxima Centauri, is 4.2 Light Years away. The Voyager spacecraft left the solar system at 37,000 miles per hour. At that speed, it would take Voyager 80,000 years to reach Proxima Centauri. The most obvious challenge to practical interstellar travel is speed. Our nearest neighboring star is 4.2 Light Years away. Trip times to reach our nearest neighboring star at conventional speeds would be prohibitively long. At 55 miles-per-hour for example, it would take over 50 million years to get there! I don’t think even the twinkies in the glove box would survive that long. At a more typical spacecraft speed, for example the 3-day trip time that it took the Apollo spacecraft to reach the moon, it would still take over 900 thousand years. I still don’t think the twinkies will make it. And even if we consider the staggering speed of 37-thousand miles-per-hour, which was the speed of the NASA Voyager spacecraft as it left our solar system years ago, the trip would still take 80,000 years. Maybe the twinkies would make it, but there would be nothing left on board to eat them. In conclusion, if we want to cruise to other stars within comfortable and fundable time spans (say, less than a term in Congress), we have to figure out a way to go faster than light. A less obvious challenge is overcoming the limitations of rockets. The problem is fuel, or more specifically, rocket propellant. Unlike a car that has the road to push against, or an airplane that has the air to push against, rockets don’t have roads or air in space. Today’s spacecraft use rockets and rockets use large quantities of propellant. As propellant blasts out of the rocket in one direction, it pushes the spacecraft in the other - Newton’s third law. The farther or faster we wish to travel, the more propellant we’ll need. For long journeys to neighboring stars, the amount of propellant we would need would be enormous and prohibitively expensive. This chart highlights two critical features of a rocket, Thrust and Specific Impulse. Thrust is how much push a rocket can give. The higher up on the chart, the greater the push. Specific Impulse can be thought of as a kind of fuel efficiency for rocket engines, analogous to the miles-per-gallon for cars. The farther right on the chart, the less propellant you’ll need. It really has to do with how fast the fuel blasts out of the rocket. What you should notice is the red region. This is the range of rocket performance we can conceivably create with what we know today. And what we need for interstellar travel is in that desired region or even more fuel efficient. Here are four examples [image below] of what it would take to send a canister about the size of a Shuttle payload (or a school bus) past our nearest neighboring star... and allowing 900 years for it to make this journey. Well.... If you use chemical engines like those that are on the Shuttle, well..., sorry, there isn’t enough mass in the universe to supply the rocket propellant you’d need. So let’s step up to next possibilities, nuclear rockets with a predicted performance that’s 10 to 20 times better! Well...it’s still not looking all that good. For a fission rocket you would need a BILLION SUPERTANKER size propellant tanks to get you there, and even with fusion rockets you would still need a THOUSAND SUPERTANKERS! Even if we look at the best conceivable performance that we could engineer based on today’s knowledge, say an Ion engine or an antimatter rocket whose performance was 100 times better that the shuttle engines, we would need about ten railway tanker sized propellant tanks. That doesn’t sound too bad, until you consider that we didn’t bring along any propellant to let us stop when we get to the other star system...or if we want to get there quicker than 9 centuries. Once you add the desire to actually stop at your destination, or if you want to get there sooner, you’re back at the incredible supertanker situation again, even for our best conceivable rockets. In conclusion, we’d really like to have a form of propulsion that doesn’t need any propellant! This implies the need to find some way to modify gravitational or inertial forces or to find some means to push against the very structure of spacetime itself. Our third big challenge is energy. Even if we had a non-rocket space drive that could convert energy directly into motion without propellant, it would still require a lot of energy. Sending a Shuttle-sized vehicle on a 50 year one-way trip to visit our nearest neighboring star (subrelativistic speed) would take over 7 x 10^19 Joules of energy. This is roughly the same amount of energy that the Space Shuttle’s engines would use if they ran continuously for the same duration of 50 years. To overcome this difficulty, we need either a breakthrough where we can take advantage of the energy in the space vacuum, a breakthrough in energy production physics, or a breakthrough where the laws of kinetic energy don’t apply. Right now we don’t even know if practical interstellar travel is possible. Just because we don’t know how to do something today, however, doesn’t mean that it is impossible. There is a historical pattern that has emerged where the grand visions of yesterday’s science fiction inspired today’s reality. Maybe the same will happen with today’s science fiction. A long time ago, Jules Verne wrote a story about sending people to the moon by blasting them out of a giant cannon. That story inspired a whole host of rocketry pioneers who pondered how to make such a journey a reality. Based on the science of their day, they were eventually able to create visions of how to achieve such a feat - using rockets instead of cannons. And, when all the conditions were right, these visions evolved into reality. Now, we look back over 25 years to our landing people on the moon and bringing them back safely. This next example is about routine access to space. In this case the inspirations were from Buck Rogers and Flash Gordon stories with their rockets gallivanting across space as routinely as that era’s aircraft flew in the air. Again, such stories inspired rocketry pioneers who created visions, and reality followed. In this case the Space Shuttle. And now the inspirations behind this web page - Journeys to the stars. 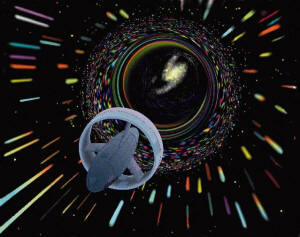 The idea of "Warp Drives" and "Hyper Space" date back to the 1930’s and are attributed to John Campbell. Another appropriate example is the 1956 movie "Forbidden Planet." Its opening sequence has a prediction of how humanity conquers gravity and then goes on to discover how to exceed light speed. And a very well known example is, of course, Star Trek. But today, we don’t even have the scientific principles from which to create the visions. First we need to develop such science and then we can engineer the visions and shape them into reality. Because of its widespread familiarity, Let’s examine the Star Trek inspirations. We would like to point out that although such science fiction vehicles and ones from other stories like Star Wars are inspirational, they are science fiction, not research guides for real science. By that we mean that there is not enough substance behind these vehicles and the techno-speak that is used to describe them that you could begin a research program. They are however, inspirational, and they do provide mental pictures that make it easier to contemplate how you might achieve such feats. This inspiration shows some of the features we would need for our interstellar craft. 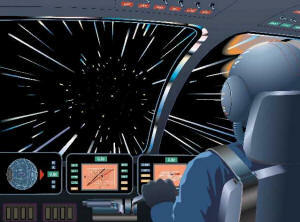 Faster than light propulsion, sometimes called "warp drive", "hyperspace drive", etc. The point is that we would like some form of propulsion that can get us there in comfortable timeframes. Also note that this propulsion does not use propellant -- a crucial feature. The Trek vehicle has a variety of features that all imply that we have mastered the control of gravity or inertia: These things called "Inertial Dampers" on Star Trek are what help keep the crew from flying out of their seats when the ship maneuvers. The "deflectors" help move objects out of the way so that the ship doesn’t smash into them at damaging speeds. And "synthetic gravity" is so the crew can walk about normally. And in movies this makes their special effects budget much, much smaller. The control over gravitational forces could also be used to propel the vehicle without the need for rockets. It is in this propulsion role where the feat of gravity control would bring the most benefit. If we ever, or should I say more optimistically, when we conquer gravity, it will be an enormous breakthrough for space travel and for scientific and technological advances in general. That would usher in an exciting age for humanity. And to power the vehicle and its propulsion, some form of power generation is needed. In Trek, they talk a lot about Antimatter, so we have provided a status on that topic. A ruler for advancement Or, Where do we stand today? This ruler measures how close we are to having this feature as a normal part of our lives. Conjecture: The very beginning of the quest for knowledge. This is when you know what you’d like to accomplish, but you have no idea if it is even possible. Speculation: When you have learned enough to know what you do know, and know what you don’t toward solving the problem. Science: The level when you have learned how nature works. You now know if something can be done and what it will involve. Technology: The level when you can begin to engineer and build working devices to apply those laws of nature to answer your goal. Application: The final state when the technology is good enough to be put to common use. Cars, airplanes, microwave ovens are all in this category. We are at the point where we know what we do know and know what we don’t, but do not know for sure if faster than light travel is possible. 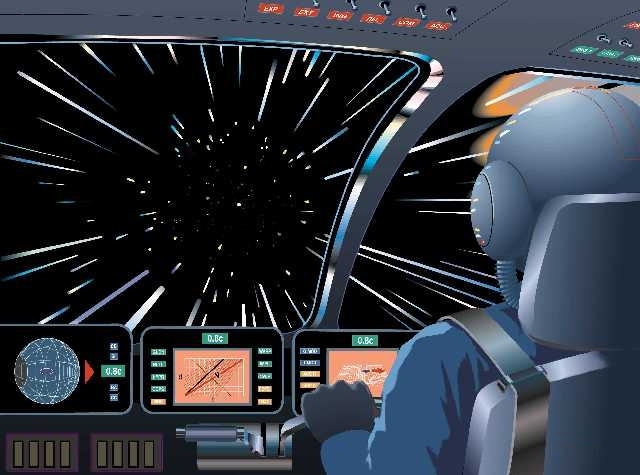 The bad news is that the bulk of scientific knowledge that we have accumulated to date concludes that faster than light travel is impossible. This is an artifact of Einstein’s Special Theory of Relativity. Yes, there are some other perspectives; tachyons, wormholes, inflationary universe, spacetime warping, quantum paradoxes... ideas that are in credible scientific literature, but it is still too soon to know if such ideas are viable. One of the issues that is evoked by any faster-than-light transport is time paradoxes: causality violations and implications of time travel. As if the faster than light issue wasn’t tough enough, it is possible to construct elaborate scenarios where faster-than-light travel results in time travel. Time travel is considered far more impossible than light travel. "Why can’t we break the light speed barrier too, what’s the big difference?" It is too soon to tell if the light barrier can be broken, but one thing is certain -- it’s a wholly different problem than breaking the sound barrier. The sound barrier was broken by an object that was made of matter, not sound. The atoms and molecules that make up matter are connected by electromagnetic fields, the same stuff that light is made of. In the case of the light speed barrier, the thing that’s trying to break the barrier is made up of the same stuff as the barrier itself. How can an object travel faster than that which links its atoms? Like we said, it’s a wholly different problem than breaking the sound barrier. Rule Number 1: The distance you’ll travel (d) depends on how fast you move (v), for how long you’re moving (t). If you drive 55 mph for one hour, you’ll have covered 55 miles. - simple. Rule Number 2: This is the mind boggling one - No matter how fast you’re moving, you’ll always see the speed of light as being the same. When you combine these together and compare what one traveler "sees" relative to another traveler at a different speed - that’s when the problems come into play. Let me give you another way to picture this. Close your eyes. Imagine that the only sense that you had was the sense of hearing. All that you know is sounds. You identify things by how they sound. So when a train goes by, did its horn really change? We know that the horn was always tooting the same tone, but it was the train’s motion that made it appear to change because of something called the Doppler shift. Its a similar situation with light. Everything we know around us we know by light, or more generally electromagnetism. What we see, what we feel (the air molecules bouncing off our skin), what we hear (air molecules bouncing off each other in waves of pressure), even the propagation of time, are all governed by electromagnetic forces. So when we start moving at speeds approaching the speed by which we are getting all our information, our information gets distorted. In principle it’s that simple. Understanding it well enough to do something about it, well that’s a different matter. One of the consequences of this Special Relativity is the light speed barrier. Here’s another way to look at it. To move faster, you add energy. But when you get going near the speed of light, the amount of energy you need to go faster balloons to infinity! To move a mass at the speed of light would take infinite energy. It appears that there is a distinct barrier here. Is there any way around Special Relativity? Maybe. Is there any work being done to search for these breakthroughs? Yes, but not much. In addition to the individual theoretical work of such physicists as Matt Visser, Michael Morris, Miguel Alcubierre, and others, there is the new NASA Breakthrough Propulsion Physics program. If you could control gravity or inertial forces, you would have a propulsion breakthrough (thrusting without rockets), a means to create synthetic gravity environments for space crews, a means to create zero-gravity environment on Earth - hey that could be fun - and a whole host of other things. Like "Warp Drives", this subject is also at the level of speculation, with some facets edging into the realm of science. We are at the point where we know what we do know and know what we don’t, and there is a lot that we don’t know. The better news is that there is no science that says that gravity control is impossible. First, we do know that gravity and electromagnetism are linked phenomena. We are quite adept at controlling electromagnetic phenomena, so one can presume that such a connection might eventually lead to using our control of electromagnetism to control gravity. General Relativity, another one of Einstein’s doings, is one way to describe such connections. Another way is through new theories from quantum mechanics that link gravity and inertia to something called "vacuum fluctuations." Is this subject being studied? Historically, gravity has been studied in the general sense, but not very much from the point of view of seeking propulsion breakthroughs. With the newly formed NASA Breakthrough Propulsion Physics program, that situation is changing. Antimatter is real stuff, not just science fiction. Antimatter is firmly in the realm of science with some aspects even entering the technology realm. There is also a lot of speculation about what one might do with antimatter. Antimatter is matter with its electrical charge reversed. Anti-electrons, called "positrons," are like an electron but with a positive charge. Antiprotons are like protons with a negative charge. Positron, antiprotons and other antiparticles can be routinely created at particle accelerator labs, such as CERN in Europe, and can even be trapped and stored for days or weeks at a time. And just last year, they made antihydrogen for the first time. It didn’t last long, but they did it. Also, Antimatter is NOT antigravity. Although it has not been experimentally confirmed, existing theory predicts that antimatter behaves the same to gravity as does normal matter. Technology is now being explored to make antimatter carrying cases, to consider using antimatter for medical purposes, and to consider how to make antimatter rockets. Right now it would cost about One-Hundred-Billion dollars to create one milligram of antimatter. One milligram is way beyond what is needed for research purposes, but that amount would be needed for large scale applications. To be commercially viable, this price would have to drop by about a factor of Ten-Thousand. And what about using antimatter for power generation? - not promising. It costs far more energy to create antimatter than the energy one could get back from an antimatter reaction. Right now standard nuclear reactors, which take advantage of the decay of radioactive substances, are far more promising as power generating technology than antimatter. Something to keep in mind, too, is that antimatter reactions - where antimatter and normal matter collide and release energy, require the same safety precautions as needed with nuclear reactions. Transporters are only at the very first step of evolution. - conjecture. We know what we’d like to accomplish, but we haven’t got a clue what physics we’ll even need to learn about. The closest topic to a transporter that we do have some understanding of is wormholes. Because this subject is much less developed than the search for gravity control or hyperfast propulsion, there is little or no work being directly aimed at the question of "Transporters." The following section has a brief description of some ideas that have been suggested over the years for interstellar travel, ideas based on the sciences that do exist today. The first example is from the 1950’s-60’s, Project Orion - which offered to use nuclear bombs for a constructive purpose - space travel. About 5 bombs per second are dropped out the back and detonated to propel the craft along. A huge shock plate with shock absorbers make up the base of the craft. Experiments using conventional explosives were conducted to demonstrate the viability of this scheme. Although this vehicle was conceived to take a crew to Mars, it can also be considered for sending smaller probes to the stars. This project ended with the nuclear test ban treaty in the 60’s. In the late 1970’s the British Interplanetary Society revisited the Orion propulsion concept (below image), but at a more reasonable scale and for in-space use only. In this case it used micro fusion explosions which relied on obtaining the appropriate fuel isotope from Jupiter that it scooped up on its way out of the solar system - tricky. Well, rather than bring your fuel along, why not get it as you go. This Bussard Interstellar Ramjet concept, from the 1960’s, relies on scooping up the lonely protons that drift in interstellar space, and then somehow getting them to fuse to make a nuclear rocket. There are a variety of limitations to this concept, such as how many protons can be scooped up, the drag created from scooping them, and, not to mention, the feat of getting these protons to engage in nuclear fusion for a rocket. Light sails are another possibility. Rather than use rockets, why not use light. When light strikes an object, it pushes on it ever so slightly. Use lots of light over a very large area, and the forces get noticeable. That is the idea here. Robert Forward proposed using a 10-million-gigawatt laser to shine through a thousand kilometer Fresnel lens onto a thousand kilometer sail. With these numbers, it is claimed that one could send a thousand-ton vehicle with crew to our nearest star in 10 years! That 10-million-gigawatt laser. That power level is ten thousand times more than the power used on all the Earth today. So, Forward revised the concept to more reasonable power levels. This time it only has a 10-gigawatt microwave laser (still a feat unto itself), and this time the vehicle is a frail 16 grams of fine wires spread over just one kilometer. The sail has all its sensors and stuff built right into its array of wires. This and similar concepts are still under investigation. Significant advances are still required, however, before we can create such systems and before we have a sufficiently robust space program that could put them in space. Just when you thought it was confusing enough, those physicist had to come up with wormholes. Here’s the premise behind a "wormhole." Although Special Relativity forbids objects to move faster than light within space-time, it is known that space-time itself can be warped and distorted. It takes an enormous amount of matter or energy to create such distortions, but distortions are possible, theoretically. To use an analogy: even if there were a speed limit to how fast a pencil could move across a piece of paper, the motion or changes to the paper is a separate issue. In the case of the wormhole, a shortcut is made by warping space (folding the paper) to connect two points that used to be separated. These theories are too new to have either been discounted or proven viable. And, yes, wormholes do invite the old time travel paradox problems again. First, collect a whole bunch of super-dense matter, such as matter from a neutron star. How much?- well enough to construct a ring the size of the Earth’s orbit around the Sun. Then build another ring where you want the other end of your wormhole. Next, just charge ‘em up to some incredible voltage, and spin them up to near the speed of light - both of them. Well if you could do all that, and notice you already had to be where you wanted to go to, I’m sure you could think of more clever ways to travel. Don’t expect any wormhole engineering any time soon. There are other ideas out there too - ideas that use "negative energy" to create and to keep the wormhole open. Here’s what a naturally occurring wormhole might look like if it passed in front of another star. This painting (above) is from Pat Rawlings. Here’s the premise behind the Alcubierre "warp drive": Although Special Relativity forbids objects to move faster than light within space-time, it is unknown how fast space-time itself can move. To use an analogy, imagine you are on one of those moving sidewalks that can be found in some airports. The Alcubierre warp drive is like one of those moving sidewalks. Although there may be a limit to how fast one can walk across the floor (analogous to the light speed limit), what about if you are on a moving section of floor that moves faster than you can walk (analogous to a moving section of space-time)? In the case of the Alcubierre warp drive, this moving section of space-time is created by expanding space-time behind the ship (analogous to where the sidewalk emerges from underneath the floor), and by contracting space-time in front of the ship (analogous to where the sidewalk goes back into the floor). The idea of expanding space-time is not new. Using the "Inflationary Universe" perspective, for example, it is thought that space-time expanded faster than the speed of light during the early moments of the Big Bang. So if space-time can expand faster than the speed of light during the Big Bang, why not for our warp drive? These theories are too new to have either been discounted or proven viable. Yes... First, to create this effect, you’ll need a ring of negative energy wrapped around the ship, and lots of it too. It is still debated in physics whether negative energy can exist. Classical physics tends toward a "no," while quantum physics leans to a "maybe, yes." Second, you’ll need a way to control this effect to turn it on and off at will. This will be especially tricky since this warp effect is a separate effect from the ship. Third, all this assumes that this whole "warp" would indeed move faster than the speed of light. This is a big unknown. And fourth, if all the previous issues weren’t tough enough, these concepts evoke the same time-travel paradoxes as the wormhole concepts. It has been shown that is theoretically possible to create a continuously propulsive effect by the juxtaposition of negative and positive mass and that such a scheme does not violate conservation of momentum or energy. A crucial assumption to the success of this concept is that negative mass has negative inertia. Their combined interactions result in a sustained acceleration of both masses in the same direction. This concept dates back to at least 1957 with an analysis of the properties of hypothetical negative mass by Bondi, and has been revisited in the context of propulsion by Winterberg and Forward in the 1980’s. Regarding the physics of negative mass, it is not known whether negative mass exists or if it is even theoretically allowed, but methods have been suggested to search for evidence of negative mass in the context of searching for astronomical evidence of wormholes. A "space drive" can be defined as an idealized form of propulsion where the fundamental properties of matter and space-time are used to create propulsive forces anywhere in space without having to carry and expel a reaction mass. Such an achievement would revolutionize space travel as it would circumvent the need for propellant. A variety of hypothetical space drives were created and analyzed by Millis to identify the specific problems that have to be solved to make such schemes plausible. These hypothetical drives are just briefly introduced here. Please note that these concepts are purely hypothetical constructs aimed to illustrate the remaining challenges. Before any of these space drives can become reality, a method must be discovered where a vehicle can create and control an external asymmetric force on itself without expelling a reaction mass and the method must satisfy conservation laws in the process. Hypothetical Differential Sail: Analogous to the principles of an ideal radiometer vane, a net difference in radiation pressure exists across the reflecting and absorbing sides. It is assumed that space contains a background of some form of isotropic medium (like the vacuum fluctuations or Cosmic Background Radiation) that is constantly impinging on all sides of the sail. Hypothetical Diode Sail: Analogous to a diode or one-way mirror, space radiation passes through one direction and reflects from the other creating a net difference in radiation pressure. Hypothetical Induction Sail: Analogous to creating a pressure gradient in a fluid, the energy density of the impinging space radiation is raised behind the sail and lowered in front to create a net difference in radiation pressure across the sail. Hypothetical Diametric Drive: This concept considers the possibility of creating a local gradient in a background scalar property of space (such as gravitational potential) by the juxtaposition of diametrically opposed field sources across the vehicle. This is directly analogous to negative mass propulsion. The diametric drive can also be considered analogous to creating a pressure source/sink in a space medium as suggested with the Induction Sail. Hypothetical Pitch Drive: This concept entertains the possibility that somehow a localized slope in scalar potential is induced across the vehicle which causes forces on the vehicle. In contrast to the diametric drive presented earlier, it is assumed that such a slope can be created without the presence of a pair of point sources. It is not yet known if and how such an effect can be created. Hypothetical Bias Drive: This concept entertains the possibility that the vehicle alters the properties of space itself, such as the gravitational constant, G, to create a local propulsive gradient. By modifying Newton’s constant to have a localized asymmetric bias, a local gradient similar to the Pitch Drive mechanism results. Hypothetical Disjunction Drive: This concept entertains the possibility that the source of a field and that which reacts to a field can be separated. By displacing them in space, the reactant is shifted to a point where the field has a slope, thus producing reaction forces between the source and the reactant. Although existing evidence strongly suggests that the source, reactant, and inertial mass properties are inseparable, any future evidence to the contrary would have revolutionary implication to this propulsion application. Science and technology are continuing to evolve. In just the last few years, there have been new, intriguing developments in the scientific literature. Although it is still too soon to know whether any of these developments can lead to the desired propulsion breakthroughs, they do provide new clues that did not exist just a few short years ago. 1996 Eberlein: Theory suggesting that the laboratory observed effect of sonoluminescence is extraction of virtual photons from the electromagnetic zero point fluctuations. 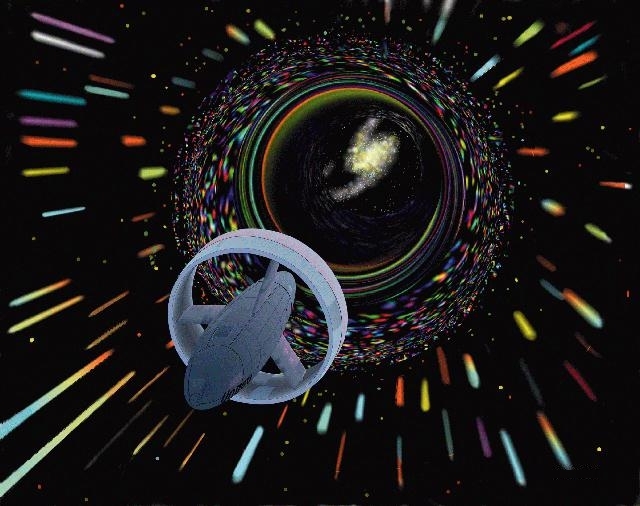 1994 Alcubierre: Theory for a faster-than-light "warp drive" consistent with general relativity. 1994 Haisch, Rueda, and Puthoff: Theory suggesting that inertia is a consequential effect of the vacuum electromagnetic zero point fluctuations. 1992 Podkletnov and Nieminen: Report of superconductor experiments with anomalous results -- evidence of a possible gravity shielding effect. 1989 Puthoff: Theory extending Sakharov’s 1968 work to suggest that gravity is a consequential effect of the vacuum electromagnetic zero point fluctuations. 1988 Herbert: Book outlining the loopholes in physics that suggest that faster-than-light travel may be possible. 1988 Morris and Thorne: Theory and assessments for using wormholes for faster-than-light space travel. These emerging ideas are all related in some way to the physics goals for practical interstellar travel; controlling gravitational or inertial forces, traveling faster-than-light, and taking advantage of the energy in the space vacuum. Even though the physics has not yet matured to where "space drives" or "warp drives" can be engineered, individuals throughout the aerospace community and across the globe have been tracking these and other emerging clues. Most of this work has been fueled purely from the enthusiasm, talent, and vision of these individuals, but on occasion, there has been small support from their parent organizations. 1972 Mead Jr.: Identification and assessments of advanced propulsion concepts. 1982 Garrison, et al. : Assessment of ultra high performance propulsion. 1986 Forward: Assessment of the technological feasibility of interstellar travel. 1990 NASA Lewis Research Center: Symposium "Vision-21: Space Travel for the Next Millennium." 1990 British Aerospace Co.: Workshop to revisit theory and implications of controlling gravity. 1990 Cravens: Assessment of alternative theories of electromagnetics and gravity for propulsion. 1991 Forward: Assessment of advanced propulsion concepts. 1994 Bennett, et al. : NASA workshop on the theory and implications of faster-than-light travel. 1994 Belbruno: Conference assessing: "Practical Robotic Interstellar Flight: Are We Ready?" 1995 Hujsak & Hujsak: Formation of the "Interstellar Propulsion Society." 1988 Forward; 1989, Winterberg: Further assessments of Bondi’s 1957 theory regarding hypothetical negative mass and its propulsive implications. 1984, Forward: Conceptual design for a "vacuum fluctuation battery" to extract energy from electromagnetic fluctuations of the vacuum based on the Casimir effect (predicted 1948, measured 1958 by Sparnaay). 1994; Cramer, et. al. : Identification of the characteristics of natural wormholes with negative mass entrances that could be detectable using existing astronomical observations. 1996; Millis: Identification of the remaining physics developments required to enable "space drives," including the presentation and assessment of seven different hypothetical "space drive" concepts. 1991; Talley: Tests of "Biefeld-Brown" effect (results negative). 1995; Millis & Williamson: Tests of Hooper’s gravity - electromagnetic coupling claim (results negative). 1995; Schlicher: Evidence for thrusting using "Unsymmetrical Magnetic Induction Fields" (unconfirmed). 1996; Forward: Experimental proposals for testing vacuum fluctuation theories and other mass-modification theories. This is a snap shot of how gravity and electromagnetism are known to be linked. In the formalism of general relativity this coupling is described in terms of how mass warps the space-time against which electromagnetism is measured. In simple terms this has the consequence that gravity appears to bend light, red-shift light (the stretching squiggles), and slow time. These observations and the general relativistic formalism that describes them are experimentally supported. Although gravity’s effects on electromagnetism and space-time have been observed, the reverse possibility, of using electromagnetism to affect gravity, inertia, or space-time is unknown. The mainstream approach to better understand this connection is through energetic particle smashing. Physicists noticed that when they collided subatomic particles together they figured out how the "weak force" and electromagnetism were really linked. They cranked up the collision energy and learned of that this new "Electro-Weak" theory could be linked to the "strong nuclear force". SO.... just crank up the power some more, and maybe we’d understand gravity too. Unfortunately, the collision energies needed are not technologically feasible, even with the Super Conductor Super Collider that got canceled, but its still a thought. Zero Point Energy (ZPE), or vacuum fluctuation energy are terms used to describe the random electromagnetic oscillations that are left in a vacuum after all other energy has been removed. If you remove all the energy from a space, take out all the matter, all the heat, all the light... everything - you will find that there is still some energy left. One way to explain this is from the uncertainty principle from quantum physics that implies that it is impossible to have an absolutely zero energy condition. For light waves in space, the same condition holds. For every possible color of light, that includes the ones we can’t see, there is a non-zero amount of that light. Add up the energy for all those different frequencies of light and the amount of energy in a given space is enormous, even mind boggling, ranging from 1036 to 1070 Joules/m3. In simplistic terms it has been said that there is enough energy in the volume the size of a coffee cup to boil away Earth’s oceans. - that’s one strong cup of coffee! For a while a lot of physics thought that concept was too hard to swallow. This vacuum energy is more widely accepted today. What evidence shows that it exists? First predicted in 1948, the vacuum energy has been linked to a number of experimental observations. Examples include the Casimir effect, Van der Waal forces, the Lamb-Retherford Shift, explanations of the Planck blackbody radiation spectrum, the stability of the ground state of the hydrogen atom from radiative collapse, and the effect of cavities to inhibit or enhance the spontaneous emission from excited atoms. The most straight-forward evidence for vacuum energy is the Casimir effect. Get two metal plates close enough together and this vacuum energy will push them together. This is because the plates block out the light waves that are too big to fit between the plates. Eventually you have more waves bouncing on the outside than from the inside, the plates will get pushed together from this difference in light pressure. This effect has been experimentally demonstrated. Can we tap into this energy? It is doubtful that this can be tapped, and if it could be tapped, it is unknown what the secondary consequences would be. Remember that this is our lowest energy point. To get energy out, you presumably need to be at a lower energy state. Theoretical methods have been suggested to take advantage of the Casimir effect to extract energy (let the plates collapse and do work in the process) since the region inside the Casimir cavity can be interpreted as being at a lower energy state. Such concepts are only at the point of theoretical exercises at this point. With such large amount of energy, why is it so hard to notice? Imagine, for example, if you lived on a large plateau, so large that you didn't know you were 1000 ft up. From your point of view, your ground is at zero height. As long as you're not near the edge of your 1000 ft plateau, you won't fall off, and you will never know that your zero is really 1000. It's kind of the same way with this vacuum energy. It is essentially our zero reference point. The vacuum fluctuations have also been theorized by Haisch, Rueda, and Puthoff to cause gravity and inertia. Those particular gravity theories are still up for debate. Even if the theories are correct, in their present form they do not provide a means to use electromagnetic means to induce propulsive forces. It has also been suggested by Millis that any asymmetric interactions with the vacuum energy might provide a propulsion effect. In May 1994, Gary Bennett of NASA Headquarters (now retired), convened a workshop to examine the emerging physics and issues associated with faster-than-light travel. The workshop, euphemistically titled "Advanced Quantum/Relativity Theory Propulsion Workshop," was held at NASA’s Jet Propulsion Lab. Using the "Horizon Mission Methodology" from John Anderson of NASA Headquarters to kick off the discussions, the workshop examined theories of wormholes, tachyons, the Casimir effect, quantum paradoxes, and the physics of additional space dimensions. The participants concluded that there are enough unexplored paths to suggest future research even though faster-than-light travel is beyond our current sciences. Some of these paths include searching for astronomical evidence of wormholes and wormholes with negative mass entrances (searches now underway), experimentally determining if the speed of light is higher inside a Casimir cavity, and determining if recent data indicating that the neutrino has imaginary mass can be credibly interpreted as evidence for tachyon-like properties, where tachyons are hypothesized faster-than-light particles. NASA is operating in an age of shrinking federal budgets. Despite this, we remain committed to scientific research. It is important to maintain scientific leadership, excite and inspire society, strengthen education and scientific literacy, develop and transfer technologies to promote U.S. competitiveness, foster international cooperation to enhance programs and share their benefits, and set the stage for future air and space ventures. Let's take a look at some of NASA's activities with implications for interstellar space travel. NASA's primary effort to produce near-term, credible, and measurable progress toward conquering the following ultimate breakthroughs needed to revolutionize space travel and enable interstellar voyages. Program directed towards answering among the most fundamental questions that we can ask including: Are there worlds like the Earth around nearby stars? If so, are they habitable and is life as we know it present there? Not until we get the required breakthroughs in physics. We need visionaries to forge science into technical realities. Are you the next Faraday, Einstein, Goddard, Von Braun...? "Science fiction or fact?" - An MSNBC Survey - So what do you think about interstellar travel?